This tutorial describes how to simulate a circuit which has been implemented by VPR with back-annotated timing delays. For the purposes of this tutorial we will be using the stereovision3 benchmark, and will target the k6_N10_40nm architecture. Lets take a quick look at the generated files. LUT_MASK which defines the logic function. DFF represents a D-Flip-Flop (corresponding to .latch in the BLIF netlist). The INITIAL_VALUE parameter defines the Flip-Flop’s initial state. Different circuits may produce other types of netlist primitives corresponding to hardened primitive blocks in the FPGA such as adders, multipliers and single or dual port RAM blocks. The SDF defines all the delays in the circuit using the delays calculated by VPR’s STA engine from the architecture file we provided. Here we see the timing description of the cells in Listing 7. In this case the routing segment routing_segment_lut_n616_output_0_0_to_lut_n497_input_0_4 has a delay of 312.648 ps, while the LUT lut_n452 has a delay of 261 ps from each input to the output. The DFF latch_top\^FF_NODE\~387 has a clock-to-q delay of 124 ps and a setup time of 66ps. In order to simulate a benchmark we need a test bench which will stimulate our circuit (the Device-Under-Test or DUT). 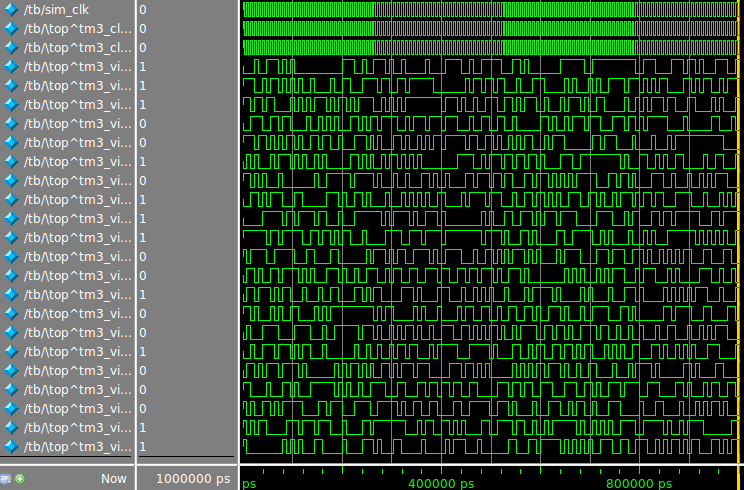 The testbench instantiates our circuit as dut at line 69. To load the SDF we use the $sdf_annotate() system task (line 72) passing the SDF filename and target instance. The clock is defined on lines 75-76 and the random circuit inputs are generated at the rising edge of the clock on lines 84-104. To perform the timing simulation we will use Modelsim, an HDL simulator from Mentor Graphics. Other simulators may use different commands, but the general approach will be similar. +bitblast: Ensures Modelsim interprets the primitives in primitives.v correctly for SDF back-annotation. +sdf_verbose: Produces more information about SDF back-annotation, useful for verifying that back-annotation succeeded. Lastly, we tell the simulation to run on line 31. Once the simulation completes we can view the results in the waveform view as shown in at the top of the page, or process the generated VCD file sim.vcd.